They would come to her at night. She would wake from sleep and see them in her bedroom: glowing balls of light that pulsed in tune to the voices inside of them. Dana wondered what to do with them. The wishes floated around her apartment like sparkling balloons. She wasn’t annoyed by them, but their constant shining made her listless. Dana wanted to do something for these people. As the days went by and there apartment filled with more glowing wishes, Dana began to wonder if Billy’s idea would work. She wondered what would happen if someone ingested someone else’s wishes. Jessie wandered around the room, touching the spheres with gentle care. They moved like balloons through the air and would grow brighter where they were touched. Jessie took them all in, the hundreds of wishes, some no bigger than a marble, others no bigger than a baseball. They all floated around the room as if Dana had her own solar system. “Well they came to you for a reason, Dana. Maybe you’re supposed to use them that way. You achieved your deepest wish when you were able to open up your bakery. So maybe you need to work your magic with these.” She gestured to the spheres with her right hand, letting it sweep across the room. Dana reached out and touched one of the spheres. It spoke, vibrating with light and she listened to the sound of other voices from other spheres speaking their wishes aloud. After Jessie left, Dana started to get ready for the day. Billy had breakfast waiting for her when she got out of the shower. At those words, the spheres started to flow out of the spare room and began to swirl around Dana in the kitchen. They all pulsed with light and the kitchen was filled with a chorus of voices. Dana and Billy looked at the swirling spheres with growing awe. The both stood in the centre of the mail storm, motionless and quiet, the humming of the spheres growing louder as they got closer. The sphere in Dana’s hands opened, as if something was pushing back a lid. Then the wish sphere’s around her began to grow smaller and smaller, shrinking in size, until the air was filled with a fine dust. It looked as if the air was filled with sparkles or wonder dust. As Dana watched, the glittering dust began to slide into the sphere she was holding it, filling it with other people’s wishes given form. As the dust flew into the sphere, a soft musical tinkling filled the air along with the sounds of people’s voices. The music filled the air with what sounded like the tinkling of stars. It intensified in volume, growing louder, until all the wish dust filled the large sphere she was holding. When the last grain of wishes had settled in the sphere, a loud sound like a gong filled the air and then everything went quiet. Dana and Billy regarded the sphere with wonder. It was glowing slightly and gave off a faint light that made Dana think of fireflies at night time. The air was still now and Dana and Billy just looked at the orb, taking it all in. “You made a wish.” Billy said. Holding the sphere carefully, Dana did so. The wishes tasted softly sweet and filled her with an instant lightness, as if her spirit was filled with brightness. She was reminded of every great thing that had ever happened to her, along with a few memories that had yet to happen. Jessie met her at the bakery an hour later. Dana had already made a huge batch of cake batter by then and was starting to fill cupcake trays with the batter. Jessie threw herself into making up more trays. They were opening the bakery a couple of hours, so they had time to get a few batches done and cooled before people started arriving. Dana finished them off with icing, some in gold and some in silver. Each of them were topped with an edible star decoration. Dana and Jessie stood back to look at the first batch. “They’re gorgeous.” Jessie said. Customers started rolling in. They always came back every day to see what was on special. 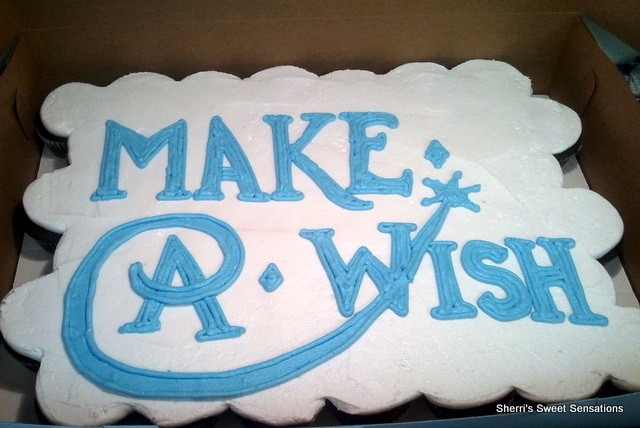 Today, the Wish Cakes stood front and centre. One woman approached the counter and looked at the pastries on offer, but her eyes were drawn towards the Wish Cakes. “Don’t mind if I do.” She chose a silver topped cupcake and closed her eyes, saying her wish internally, then bit into the cupcake. The woman seemed to glow for a moment, as if she were sparkling. Opening her eyes, she regarded Dana with a wide eyed smile. As word of her Wish Cakes spread, her fame as a baker grew. Dana knew that she owed her thanks to the thousands of others that continued to believe in magic and would wish upon stars. To thank them, Dana would stand with Billy on their balcony and watch the stars. She knew when someone made a wish on a star as it seemed to glow brighter than all the rest in the sky. When she talked to Jessie about it while they were making more cupcakes and other creations, wondering why the Wish Cakes worked the way they did, Jessie’s always had the same answer.